"As my administration has shown with Iran and with Cuba, we are also prepared to engage nations with which we have had troubled histories," President Obama said, while clarifying that the conditions required of North Korea for such an engagement have not been met or even attempted. President Park also stressed the need to “fully utilize” China’s role in bringing about such a proposal during the press conference. Following the news that Admiral Bill Gortney, chief of the North American Aerospace Defense Command (NORAD), found North Korea to “have the capability to reach the homeland with a nuclear weapon from a rocket,” the US, with South Korea at its side, appears more open to eventual talks with North Korea than ever before. North Korea, believed to have enough fissile material for 10 to 16 nuclear bombs, has conducted three nuclear tests in the last decade and has a program to develop mobile ballistic missiles. Recent developments in North Korea, formally referred to as the Democratic People’s Republic of Korea, reflect the complicated prospects of improving relations with its neighbors and the US. In August, North Korean fighters launched a small rocket into South Korean loudspeakers incessantly blaring anti-North messages, and South Korea retaliated with 36 artillery rounds. South Korea had started its loudspeaker messaging for the first time in years after two of its soldiers were wounded by North-set landmines in the Korean Demilitarized Zone (DMZ). Soon after, however, both Koreas de-escalated and agreed to continue their preparations for the scheduled reunions of families separated since the end of the Korean War in 1953. Shared events like this one fuel optimism about reunification, and Park has made such policy a goal in her administration. Obama shares that hope as well, but expresses it using a different choice of words. In 2012, Obama spoke to students at the Hankuk University of Foreign Studies, some of whom escaped North Korea. This year, Obama took part in a series of YouTube interviews when one host, Hank Green, brought up the subsequent sanctions imposed on North Korea in light of the Sony hack. “I was surprised to find that there were any sanctions that we could sanction that hadn't been sanctioned yet. Like, how is there anything left?” Green asked. For South Korea President Park, however, “collapse” is not the preferred talking point. Her approach is more about gradualism and building inter-government relationships. As North Korea’s Korean Worker’s Party just celebrated its 70th anniversary, some say Park’s talk of reunification is pie-in-the-sky. Moon Chung, a member of Park’s committee for unification preparation, told the Guardian progress would only come when the US normalizes its relationship to North Korea. “The US has got to follow the Iranian deal model,” he said. Still, others say even if that was done, reunification would be a long shot. Estimates on the price tag of Korean unity vary as low as $50 billion and as high as $3 trillion. South Korea, with a population of about 50 million, has an economy 43 times larger than North Korea, which has about 25 million citizens. 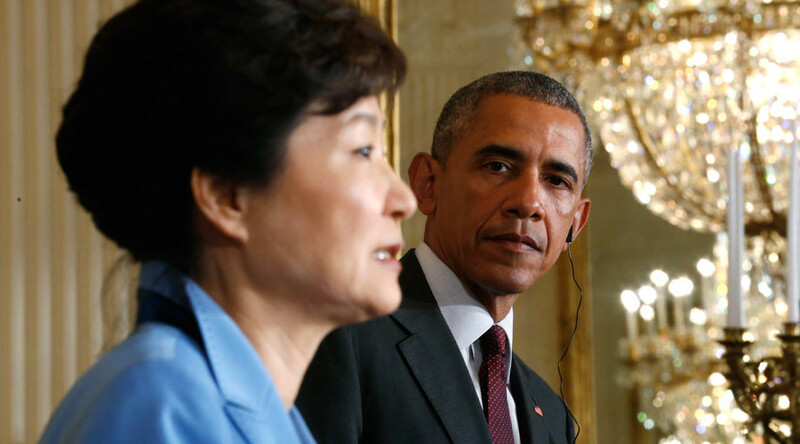 As South Korea itself bolsters its relationship with China, Park urged Obama to work with Beijing on a variety of issues, including nuclear talks with North Korea, the Washington Times reported. “We will continue to strengthen our coordination with China and the other parties in order to bring North Korea, which has refused all offers of denuclearization dialogue, back to credible and meaningful talks as soon as possible,” a joint statement between the US and South Korea read. Relations between the US and China have been tense, as America has been increasing its presence in Asia while Beijing has also been asserting its power in the region. The two countries have traded words over cybersecurity, territorial disputes and more. A highly anticipated diplomatic session involving China, Japan, and South Korea in Seoul is set for early November. While the US isn’t a part of the talks directly, its 28,500 troops in South Korea and 50,000 in Japan serve as a reminder of its interests at play in a region ready for a better tomorrow.